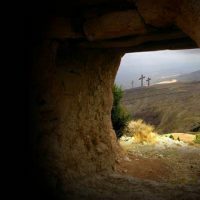 As Easter nears, parents all over are wondering the best way to teach their children about Jesus’ death and resurrection. It can be an incredibly difficult concept for children to grasp. In my preschool, we discuss the topic of Jesus’ death and resurrection in terms of a sad day and a happy day. His death is of course a sad day, but then his resurrection is such a happy day! We try to use terminology that is relatable to the children and as I’m thinking about Easter, thinking about that sad day and happy day, I realize just how relatable it is to us as well. What a gift we can give our children by helping them realize that sad and happy days are a part of our lives. Jesus’ sad day and death was followed by a happy day and resurrection, saving us from an eternity away from our Heavenly Father. As we go through life and have difficulties (sad days) we can rest in the hope that a happy day is coming. We have a beautiful Father who blesses us abundantly and who loves us tremendously. If Jesus’ sad day can end in a happy day, then so can ours But how can we use this incredibly difficult topic to teach our children perseverance and faith? How can we use the death and resurrection of Jesus Christ to remind our children that even in the difficult times, God is with us—and even if we are having a sad day, there is a happy day on the horizon? As you present this idea of the sad day and happy day to your children, I encourage you to focus on praising God in the hard times. Show your children that God is worthy of praise even on the bad days. Praise Him openly for your trials and tribulations, thanking Him for the strength, patience or peace to keep going. As we celebrate Easter with our children, let’s begin to think about and implement how we can use Jesus’ sad day, happy day to grow in a closer relationship with Him. Let’s use this time of year to instill in our children the understanding that Jesus is with us on our sad days and He is with us on our happy days. By: Angela Jamison is a foster/adoptive mother of five. When she is not with her children, she is directing a Christian preschool, spending her days instilling God’s love in the littlest of her community. To learn more about Angela, check out her blog at www.angelajamison.com or follow her on Facebook (@barrenbutblessed), Twitter (@AngJamison04) or Instagram (@angjam731).